Glenn Hawley is care-worn and just plain wore out. He gave up a law enforcement career to save his family, only to find himself on the wrong side of progress and teetering on bankruptcy. He needs a reason to get up in the morning...a reason to fight. The old saw - be careful what you wish for - comes home to roost when the fight lands on his doorstep in a hail of bullets. Unable to escape his past mistakes, and with the consequences of bad luck and poor choices closing in from every side, everything Glenn Hawley cares about is in jeopardy. It's going to take more than a village to help the ex-sheriff save his ranch, his way of life and the family he is willing to risk everything for. As for his own redemption, sometimes it only takes one person to make all the difference. In the shadow of Wyoming's sweeping national grasslands, when history and the present collide, it will take more than a united front to protect an uncertain future where the stakes are high and courage is all a man has left. 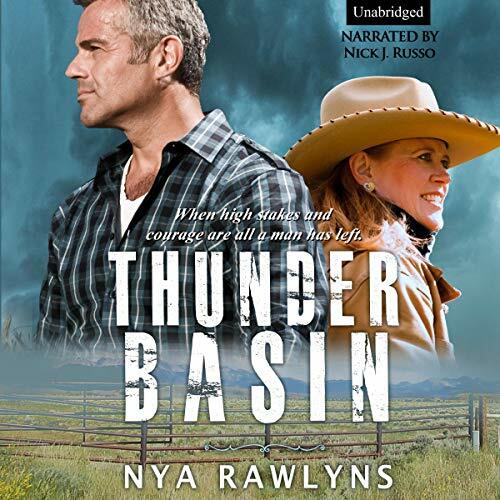 Thunder Basin explores one man's search for redemption and second chances. It is a character study in a contemporary western mystery-suspense setting, and includes a dollop of MF romance, high action, and humor. This audiobook was provided by the author, narrator, or publisher at no cost in exchange for an unbiased review courtesy of AudiobookWorm.